This lady is definitely gifted with a beautiful voice and she celebrates her birthday today. Kudos to this lady who still at this age has a strong passion for music. 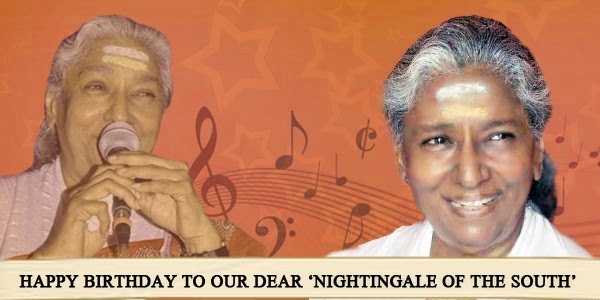 Popularly known as the Nightingale of the South, S.Janaki has sung more than 23,000 songs!! Isn’t that just amazing? One can say it is a record of its own altogether that not many singers have cracked. Her ‘Inji Iduppuazhaga’ is just one of those songs which even as time passes cannot be replaced with any other song. Her voice by itself is very unique and her pitch ofcourse is wonderful. As everyone would be aware, Janaki is one of those talented singers who can manipulate her voice to various tones – even to that of a child to a young lady, to an old man as well!! This talent store has won many a awards and ofcourse she totally deserves all of them. Her first national award although is worth a mention which she bagged for the song ‘Senthoora poove’ from the movie 16 vayathinile. The lyrics and the tone of her voice blended perfectly well making it one of the best songs of the era. She was bestowed with ‘Kalamamani’ honour way back in the late 1980’s. She is one singer we can confidently say is ‘the singer of the century’. Her humble attitude is loved by all music directors including A.R.Rahman of this era who made sure he used her voice to the best in the song ‘Margazhi thingal allava’ in the movie ‘Sangamam’. Well our Ulaganayagan and Superstar could not have romanced their heroines if not for this lady who has been the reason behind some of their best duet numbers. Janaki although aged, has depicted pure passion for music and is infact very keenon training youngsters. She does her best by giving valuable tips to youngsters on reality shows even now. Such is the levels of her commitment! We wish this lovely lady a very happy birthday!